POLL: Coloured Pencils - colour or brand? Which is more important - colour or brand - when buying coloured pencils? 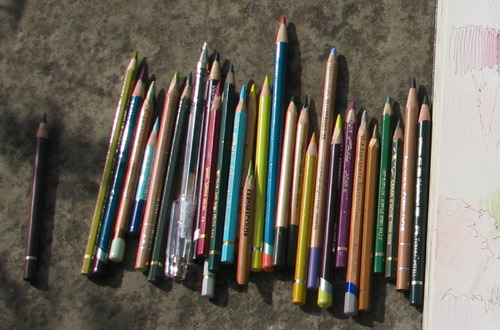 This post is about a new opinion poll for coloured pencil artists. People vary as to whether they prioritise colour or brand when making their purchase of coloured pencils. My own personal preference is to go for the best colour from a reliable good quality brand. Hence I vary as to which brands I favour for different colours - and use most brands in the process! Other people are dedicated to using one brand - or maybe two. Possibly because that's all the local art store stocks and they haven't yet got used to ordering online. Here are some possible options identified in a new Opinion Poll I'm running on Coloured Pencils - Resources for Artists. Click this link to access the poll POLL: Coloured Pencils - do you go for Colour or Brand? Below is a sample of the coloured pencils I was using yesterday while I was Sketching the Herb Garden at Sissinghurst. Guess which answer I'll be ticking! I've not yet seen a Wacom Inkling - however I have seen the tutorial videos on YouTube and wanted to research it so this week I'm sharing what I've found. In the future I'll be summarising the verdicts of those who have seen and used it - with particular reference to those who are artists and illustrators and not just technical journalists. It appears as if the Wacom is being launched mid September in the USA but there's no date for launch elsewhere that I've yet been able to identify. First the official videos by Wacom - which is probably as blatant an example of using YouTube to market a product as I've ever seen! Note the Wacom videos are available on the USA site but not the Europe channel of Wacom YouTube. 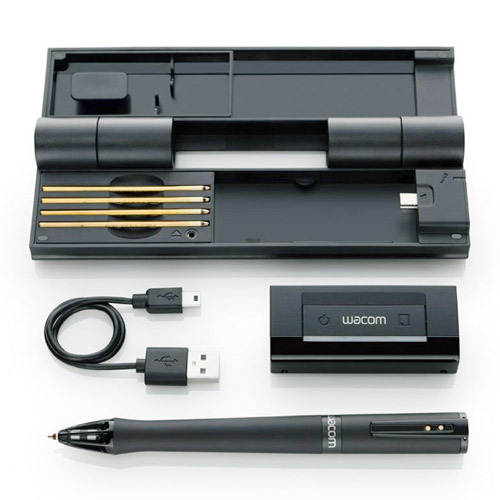 Third - the links to reviews of the Wacom Inkling - for a future post as it turns out as I can't find any to date! Last - I'd like to hear what you think of the Wacom Inkling. My initial reaction was that I liked the idea but I'd want to wait until they brought out a "fine nib" as the current one looks a bit too "medium" for me. What is a Wacom Inkling? Here are the Wacom videos. The ones after the first one were only published last week I'd like to emphasise that all the descriptions are quotes which come straight from Wacom. Wacom introduces Inkling, a new digital sketch pen that captures a digital likeness of your work while you sketch with its ballpoint tip on any sketchbook or standard piece of paper. Replacing Inkling Pen Cartridge: This video demonstrates how to replace an Inkling ink cartridge in the tip of the pen. Charging Inkling: This video demonstrates how to charge Inkling using the carrying case and a standard USB port. Using Inkling: This video gives you some specific tips for using Inking by Wacom. Installing Inkling Sketch Manager (Mac): This video shows you how to install the Sketch Manager software on a Mac. Sketch Manager is a simple software that comes with your Inkling and is designed to help you prepare your files for distribution or further development in other creative software applications, like Adobe Photoshop and Illustrator or Autodesk Sketchbook Designer. OK - so that's the product demo - but what are the technical features? This is a brand NEW digital sketch pen. What's new is that can capture a digital likeness of your work while you sketch with its ballpoint tip on any sketchbook or standard piece of paper. (In other words you do not need a special tablet to sketch on). Retail Price: $199.99 / €169.90 / £? Summary: It's a digital pen which has been designed for rough concepting and creative brainstorming. I take this to mean they've not yet worked out how to introduce the control required to achieve fine mark-making. Suitable for: Those who use pen and ink and are interested in how to digitise the process - but aren't particularly keen on carrying a tablet around with them. no need to carry a tablet around to create digital sketches - you get to carry a compact case with pen and receiver instead! the issue with a lot of digital sketching products isn't the fact it can be done, it's how much control the user has over HOW it can be done. the YouTube commentator who suggested lines should be made in pencil first has rather lost the plot! What do people think about the Wacom Inkling? I'm still looking for reviews by people who have seen this and used it and are artists not techies or technical journalists! My initial thinking is that I like a fine line, lots of control and am not a fan of drawing with a ball point. It's also rather expensive and I don't like the fact we don't know how much replacement cartridges will cost. On that basis, I don't think I can currently make a case for trying this out. Ruth Phillips writes extremely well - which I already knew from her blog Meanwhile. I thought I might know most of the stories from having read her blog for the last five years, however I was very wrong! My signed special limited edition (no. 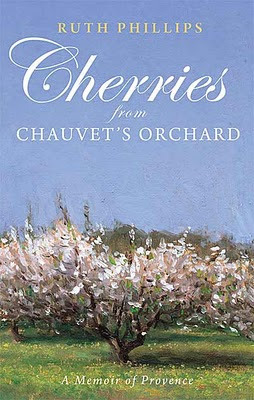 114) of Ruth's new book Cherries from Chauvet's Orchard arrived in early June and came complete with a key to the house featured in the book which a group of us rented for three weeks in June 2011. It was posted to me by Julian Merrow-Smith of Postcard from Provence fame. Which is how I ended up with two keys to enter their world as the book also provides an excellent introduction to all the places around and about Bedoin in the Vaucluse area of Provence. The chapter titles are idyllic and made me want to start reading straight away - but in the end I didn't start to read it until I was staying in their home in Provence - while Ruth played cello at the Garsington Festival and Julian got to grips with his new role of Dad of seven month old Louis! This was an early review which I read which only served to wet my appetite. Having read the book now I can only echo its comments. When you start reading a book more slowly and rationing out the pages so that you won't get to the end too quickly you know you're reading a very good book which you want to savour! After I had been reading for a while I decided to only allow myself a maximum of two chapters each night! It starts at a point before I began to know a bit about their lives. It tells us the stories of how Julian and Ruth came to meet and marry, of their life in Crillon Le Brave before they made the move to their 'new' house in Couguiuex and how the whole daily painting story (saga?) happened, took off and then delivered very real benefits in terms of improvements to their life style, domestic amenities and Julian's studio. I used to stand there with the hose in the evening - watering Ruth's potager - and thinking about how the very long story of how the water actually got to put in an appearance. What is particularly luscious for all serious foodies (that'll be me!) 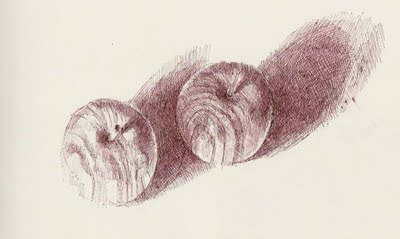 is the role that food plays in the book - and that's when we learn much more about how Julian's involvement with food goes well beyond what he liked to paint in his still life paintings. Ruth's writing about food can make me salivate! I also made very sure that the potatoes got a very good watering! It's also very illuminating and sometimes downright entertaining about what it's like living with an artist in search of his daily muse! The latter part of the book concerns their quest to be parents and how Louis entered their lives. This book is a definite "must read" for all followers of Postcard from Provence. The general consensus from all those reading along with me in Provence was that it was also a very good read, very accurate about the place and the area and we all enjoyed it enormously - and not just because we were having a go at "living the life" of a painter in Provence (see 4 Go Painting in Provence!). I bought another copy while I was there and took it home for my mother to read! This particular edition is raising funds for the orphanage in Bamako where Julian and Ruth's adopted son Louis started his life. HIGHLY RECOMMENDED: The Pilot-G-Tec-C4 rollerball pen in brown ink is my pen of choice for sketching. Summary: It has an incredibly thin line making very fine hatching incredibly easy to do. The even flow of the ink and the ease of its release also means that I can hold the pen very lightly which helps with my tenosynovitis. There is absolutely no need to press hard. It also is very good at NOT "blobbing" hence sketches are not ruined by a sudden release of a blob of ink. 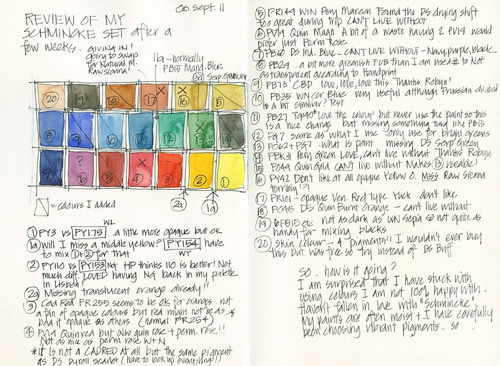 It works exceptionally well on very smooth paper such as that found in Moleskine Sketchbooks. 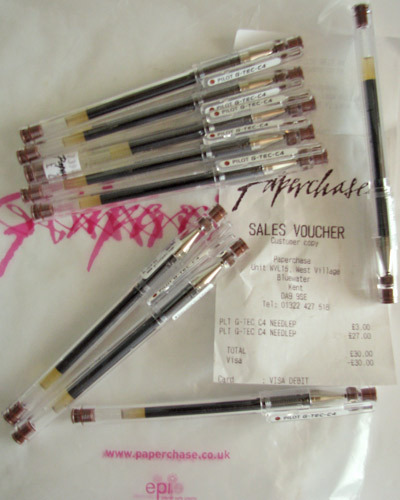 pure gel ink - which does not spread or "blob"
anybody wanting to avoid ink "blobs"
I can sometimes find these in Rymans and Paperchase (if they're in stock) - but not always in the brown/sepia colour - hence the big purchase when I do! Black, blue, red and green refills available here. Having now taken the photo and written the post I can now put my pens away in the "in stock" box! Do let me know if you have any comments about these pens.